The Calk Company has been serving industry in North Louisiana and South Arkansas since 1972. We are the oldest hydraulic hose and fitting distributor in the area having started our business with Aeroquip hose, fittings and adapters. The Calk Company has worked hard to earn our reputation as a knowledgeable and honest supply business. Over the years, we have added new product lines to compliment our hose business and now are a full line industrial supply store. We pride ourselves on giving the best service available to our customers both large and small. If you need hydraulic hose, fittings, adapters or couplings, we have the most complete inventory of Eaton Aeroquip products in our area. Our factory trained employees can assist you in selecting the best product for your specific application. We also custom build Power Steering Hoses, Air Conditioning Hoses and Brake Hoses for both trucks and automobiles. 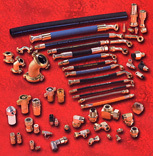 Our inventory of pipe fittings and valves includes Brass, Carbon Steel and Stainless Steel in sizes 1/8" thru 4". Look over our extensive product list and the many manufacturers we represent. © 2008 The Calk Company. All Rights Reserved.